Outerworlds is a powerful Virtual Reality 3D Chat experience that lets you visit and interact in fantastic 3D chat worlds built by its users. Are you creative? Would you like to build your own 3D chat world or Virtual Reality game content? Outerworlds 3D Chat may be the place you are looking for, where you can create fascinating Virtual Reality 3D chat worlds that your friends can come visit. The Outerworlds Universe is a thriving community of hundreds of users that interact or build Virtual Reality 3D chat environments. Here, you can explore and meet people from all over the globe. Take a quick tour and see what our community has to offer. Download the free software and come see for yourself. You will be amazed at how entertaining our virtual 3D chat universe can be! Try on an Avatar, a 3D human figure and some not so human figures. Make your Avatar dance, wave, walk and more. Visit dozens of detailed 3D chat worlds and interact with people in realtime. Click Here and Download the free 3D chat software NOW! Get the free software and become part of this growing 3D chat universe. To learn more about what Outerworlds has to offer, download the software and come on in. You’ll be glad you did! What can you do in our 3D Universe? · Build your very own 3D chat virtual reality home. 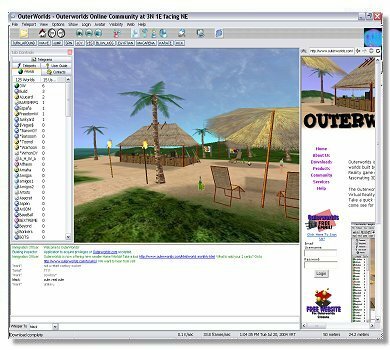 · Venture to over 100 unique virtual worlds built by the users. · Bring your friends, make new ones, or just chat with people from all over the globe. · Choose from a vast range of avatars. · Tune in and listen to our very own Virtual Reality Radio Station, WVRR. · Shop in our own 3D virtual reality mall.